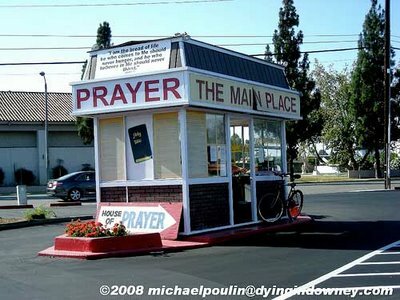 This entry was posted in Memory Monday, The Humor of It Column by Donna Pointkouski. Bookmark the permalink. Hey, I remember those! There’s one not far from me that’s a coffee place now. That first photo really brings back memories! I can so relate about not being understood by children. It seems to be almost a daily thing around here! They don’t understand phrases we old fogies use all the time like, “strike while the iron’s hot” or why the “glove box” in the car is called a glove box (but then who wears gloves in Phoenix anyway!). Michelle, we have a woman in work who still uses the term “ice box” – I know what it is, but I’m not old enough to have used it! Donna, This is getting scary. I have used an ice box. I remember well having to stop by the gas station to get those huge blocks of ice for it. The funny thing there is that my kids do know what an ice box is but only because we still have it. It’s a great antique with lots of memories. We use it to store paper goods now. My daughter is in her 20s and we had the same conversation when she was in her teens. All I needed to say then was “You, know, the little camera store in the ‘Back to the Future’ movie” and she got it, and she said back to me “Like in that 70s TV show”. So a few months ago I mentioned “Back to the Future” to a teen and she said “Never heard of that movie!” Now I really feel old! I was a route man for Fotomat in Northern NJ in the early 1970’s while in college. Drove about 150 miles a day picking up film to be developed and dropping off the developed film and supplies to the girls in the booths. Great fun! Yes, it was like getting a present when you went in and picked up your prints from the photomat. Mom would be driving as I went through the photos on the way home. just not the same with digital anymore. Hi Donna, was very interested in reading the fotomat article. 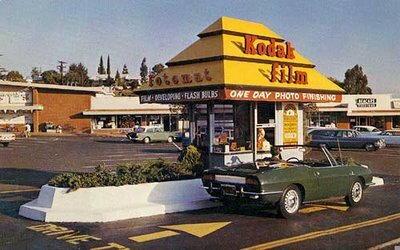 Do you have any idea if there is a list of all the 4000 or some of the stores and did fotomat sell them all? I actually worked in a Fotomat booth for a couple of years in Toronto. Ah, the memories…and no, film was not developed in there. Orders were taken, packaged up and picked up by a mysterious man, who brought them back, developed the following day. I used to work in a Fotomat booth in Lewiston, NY. It had heat in the winter and air conditioning in the summer. I used to order subs and pizza and have them delivered to the booth. I did, on occassion drink wine coolers whilst in the booth. I knew everything that was going on in Lewiston; parties, proms, weddings, baptisms, you name it…cuz everyone developed their film at Fotomat! I tricked my friend and told him that the seat was dual purpose and was also a toilet! I also tricked a customer who had asked me if we had any fuji film…I told her I had to check the basement and then slowler lowered by body down the window until I disappeared only to re-appear a few minutes later stating that I checked the basement and we were out of that film. LOL! Good times! I worked at the Fotomat in Lewiston NY from 1976 through 1981 earning the coveted title of “Fotomate of the Year” which got me a week in Jamaica! Seriously I loved that job and it paid my expenses and bar tab through college plus I knew everything that was going on. I frequently would get caught looking at customers pics, sometimes as they drove up! I would also “borrow” undies to share with my friends at Daddy’s. One night the subject of the photos was actually in the bar. If I was caught cleaning the floor, I would make it look like I was walking up a flight of stairs telling my customer I was in the darkroom developing prints or in the employee lounge. God how I loved that job! !